If children from different countries and cultures want to exchange ideas about weather and climate, then it may be a challenge. They cannot simply write to each other or call if they speak different languages. But they can create art for each other! Art transcends language, which opens up an exciting channel of communication. Someone needs to facilitate this sharing and communication, which is where the adults come in. In a recent project, I worked with artists in Norway (Eamon O’Kane, Robin Everett, Ruben Eikebø) and Bangladesh (Shakti Nomaan) to facilitate an exchange of children’s climate-art between our countries. Bangladeshi (top left) and Norwegian (top right) school children drawing how they perceive good and bad weather after hearing about art and the climates in each others countries (photo: Mathew Stiller-Reeve). The art exchange exhibitions in Bangladesh (bottom left: Mathew Stiller-Reeve) and in Norway (bottom right: Anders Totland / Bygdanytt). 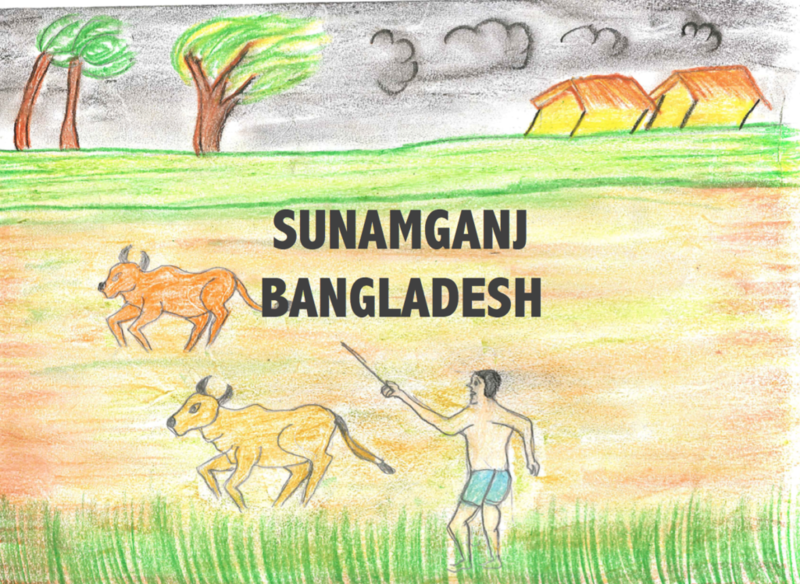 The project started when we visited my local school (Valestrandskole) on Osterøy and told the children (10-12 year olds) about our art and the monsoon climate in Bangladesh. We then challenged the children to draw pictures of what good and bad weather meant to them. Some of them drew with coloured pencils, some used charcoal, and one even used the gravel on the school’s football pitch. The children produced some amazing pictures. The pictures of good weather featured a lot outdoor activities. Whether the children were playing football, fishing, swimming, snowboarding or sledging, the sun was almost always out. Bad weather mostly included rain, but also thunder and lightning. Most of the art was very true to life, but some pictures depicted almost Picasso-like abstractions. Once the children were finished creating, we gathered the art together ready for the long journey to Bangladesh. Two weeks later, I found myself standing next to artist Shakti, and climate scientist Bashar in a classroom of very excited school children in a rural town of Sunamganj. 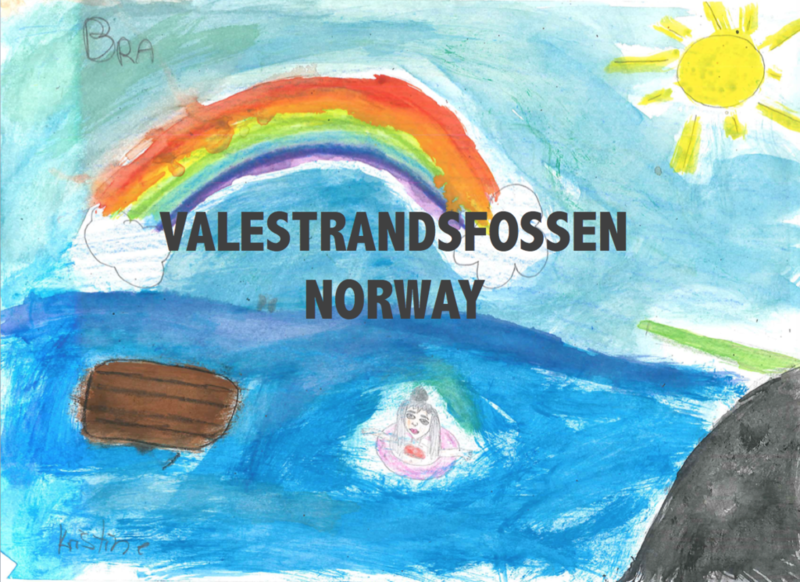 Shakti told the children about his art and Bashar and I told them about the damp, west-coast climate of Valestrand in Norway. Shakti then donned his homemade weatherglasses and guided the children in drawing their ideas of good and bad weather. Once they were finished, it was time for the big art exhibition. The older pupils, who hadn’t yet been a part of the process, helped to display the pictures from Norway. They held up the pictures in a long row in the schools playground. The other children crowded round, pointed and discussed what the Norwegian weather art. They were interested in some of the more abstract pictures that the as well as the motives depicting football and other outdoor activities. They were also excited that children in Norway would see their art too. A week or so later, we were back in Valestrand again with a bag full of fresh art. It was time to complete the climate-art exchange with our second. 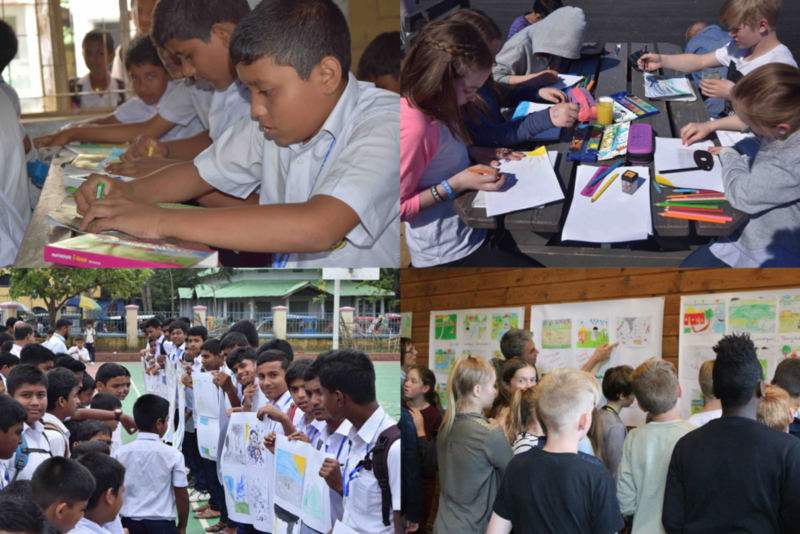 The Norwegian children were amazed by the artistic skills of their Bangladeshi counterparts. They commented on how climate and weather obviously meant something very different in Bangladesh. Football was obviously a popular pastime in both countries, but the Bangladeshi’s liked to play in the rain. Maybe the cool rain is welcome relief from the otherwise scorching sun. The sun featured in many of the good-weather pictures, but it was a lot lower in the sky and much redder. The lower sun indicated much more comfortable temperatures for the rice farmers, fishermen and boatmen who also appeared in many of the works of art. The bad weather was sometimes very dramatic. One of the children drew a tornado that could lift people into the air! Bangladesh has after all the second highest rate of tornados in the world! The school children in Norway (left: Anders Totland / Bygdanytt) and Bangladesh (right: Mathew Stiller-Reeve) proudly holding up their art before they exchanged it with each other. With the art exchange complete, we had successfully facilitated an lively exchange of ideas. Through the art, the children presented their own views on weather and climate and compared them with children from other parts of the world. They shared perspectives and understood what others were concerned about. The art told stories about the children’s local cultures and livelihoods. And in the end we are left with a beautiful repository of children’s ideas about weather and climate that can also teach us adults something. Children will after all be most impacted by future climate change. It’s important that we listen to their voices and take their ideas into consideration (you can find all the part from Norway and Bangladesh by clicking on the pictures below!). In this project, climate science and art collaborated to motivate the children. Then the art provided a platform for creating dialogue and sharing ideas between children from two very different places. 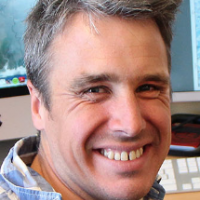 Tagged art, Bangladesh, Climate art, Eamon O'Kane, interdisciplinary, Norway, Robin Everett, Ruben Eikebø, Schools, Shakti Nomaan, Sunamganj, Valestrandsfossen.